Alfajores come in many sizes and flavors. Each region of South America has its own version. 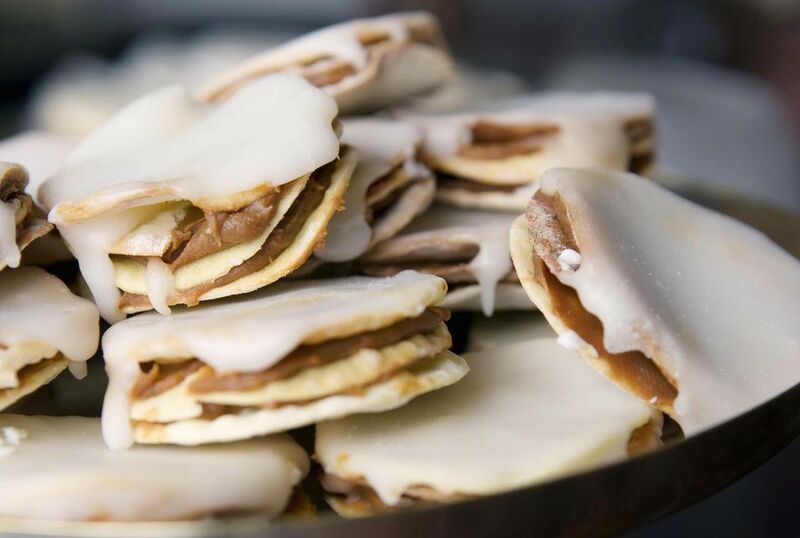 We like alfajores best when they are freshly made so that the crisp cookies contrast the soft filling, but many people prefer to wait a couple of days for the cookies to soften so that the cookie and the filling have the same texture. This traditional recipe calls for a touch of Pisco, a South American brandy, in the cookie dough. It's optional but adds a nice flavor. You can substitute any brandy for the Pisco. For an extra special cookie, make your own dulce de leche. Place the cornstarch, flour, baking powder, and salt in a bowl and mix briefly. Cut the butter into small pieces and add to the flour mixture, blending with your fingers until the mixture is smooth. Add the powdered sugar, vanilla, and Pisco, and mix with your hands until the dough is homogeneous and smooth (add another tablespoon or two of Pisco if the dough is too crumbly to form a ball). Let the dough rest in the refrigerator for 30 minutes. Roll out dough to 3/8" thickness, and cut into 2-inch circles. Place cookies on baking sheet lined with parchment paper. Bake cookies for 10 to 15 minutes, until they are barely golden brown. Let cookies cook 5 minutes, then transfer to rack to cool completely. To fill the cookies, spread one cookie with dulce de leche and top with a second cookie. Roll the edges in the coconut. To make chocolate-dipped alfajores, heat 8 ounces chocolate chips with 1 tablespoon shortening and 1 teaspoon corn syrup in the microwave for 30-second intervals, stirring after each 30 seconds, until the chocolate is melted. Dip half of the cookie (sandwiched with its filling) into the chocolate. Lift the cookie out and scrape along the edge of the bowl to remove the excess chocolate. Place on a cookie sheet lined with wax paper and let cool. When the chocolate has mostly set, roll the edges in the toasted coconut.